If you’re looking for the next big thing in fish tacos, look no further! 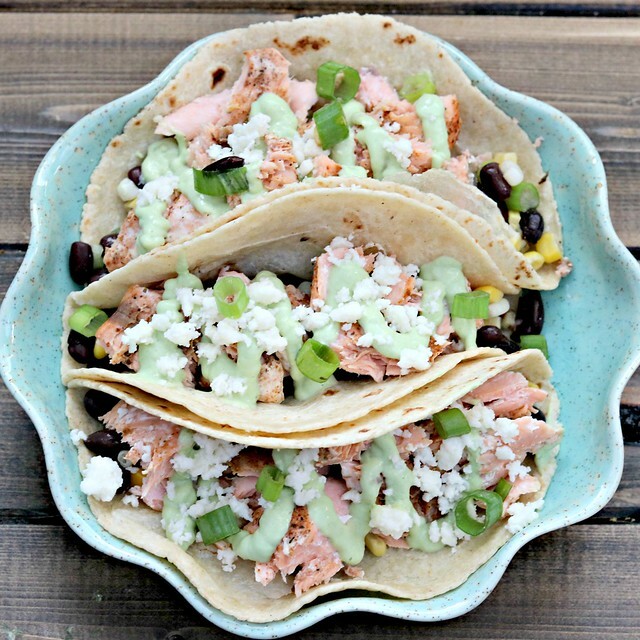 These Blackened Salmon Tacos with Avocado Jalapeno Lime Sauce have it all…spicy salmon, creamy avocado, jalapeno, and lime sauce, and a corn and black bean salad, all wrapped up in your favorite tortilla. Taco Tuesday – and fish tacos – will never be the same! It’s been a minute since I’ve made any sort of fish taco, but it’s been over a year since I made any salmon tacos. I don’t know how I let this happen. 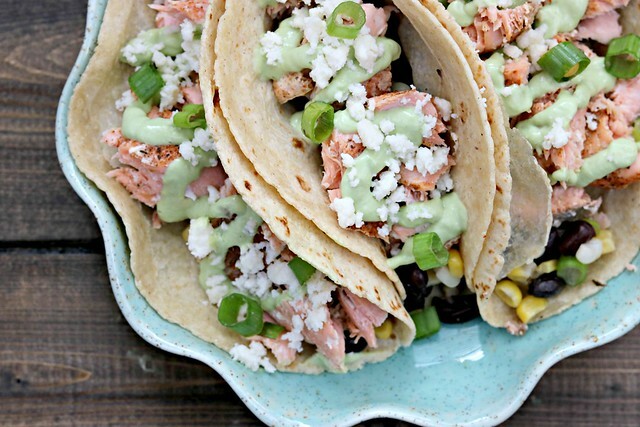 Because, in case you missed the memo, salmon tacos are the next big thing in fish tacos. I know, I know…white fish of some sort is what you will typically find in any restaurant’s traditional fish tacos, and those can definitely be great tacos. But these…these are far beyond great on the yum-factor scale. 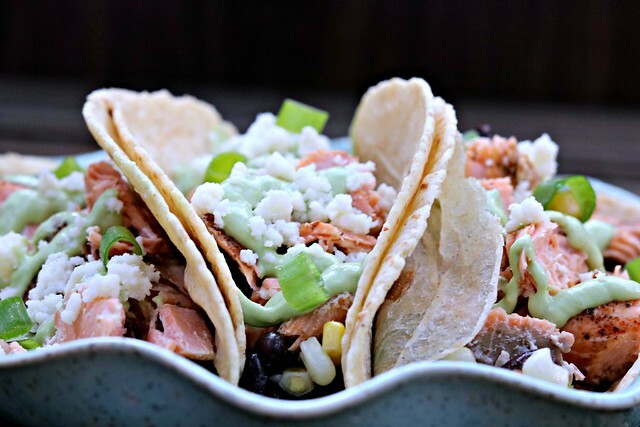 I mean, salmon is pretty fantastic to begin with, but when you season it up with blackened seasoning, bake it to flaky perfection and then put it in a warm tortilla with corn and black bean salad, all drizzled with avocado jalapeno lime crema and sprinkled with green onions and queso fresco it turns into the best salmon taco ever. Ev. Er. There’s one thing I have to tell you though, about me and blackened seasoning. I love it, but…I have learned the hard way that when I try to do the sear-on-the-stove top method of cooking, that it doesn’t like us very much. Like, fills the whole house with sneeze-inducing spices. And with a baby now, I just can’t do that to her. So, I have decided that I can still enjoy my blackened seasoning, it just has to be done via baking in the oven. Which is what I did with this salmon. So, not sneezing or nose tickling from spice-filled air, and still amazing blackened flavor all up in the salmon. I’d say that’s an all around win. Wouldn’t you? Of course, if you prefer to cook in a skillet and get that nice seared crust, by all means – do! The addition of the corn and black bean salad gives a nice added texture to the tacos, which I always love to do. The corn gives just a little bit of “crunch” to offset the softer texture of the fish and tortilla. And the sauce. Ermahgerd. There aren’t many tacos I’d choose to eat without avocado, but when I made these I just wasn’t in the mood to cut up avocado. So instead, I decided to use it in the sauce. Because, why not?? Avocados, jalapeno, and lime juice all mixed with sour cream. Yep. I stand behind my decision 100%. And once you try them, you will, too. Really…best fish tacos EVA. If you're looking for the next big thing in fish tacos, look no further! These Blackened Salmon Tacos with Avocado Jalapeno Lime Sauce have it all...spicy salmon, creamy avocado, jalapeno, and lime sauce, and a corn and black bean salad, all wrapped up in your favorite tortilla. Taco Tuesday - and fish tacos - will never be the same! In a food processor or blender, combine all of the ingredients form the avocado jalapeno lime sauce. Blend until smooth. If it seems a little thicker than you'd like, you can either add more lime juice, or add a little water (like, 1 tablespoon at a time) to thin it out. Preheat oven to 350 degrees F and line a baking sheet with foil or parchment paper. Place the salmon fillets on the prepared baking sheet, skin side down. Sprinkle the top of each piece with about 1/2 tablespoon of the blackened seasoning. Of course you can add more or less to your liking, but 1/2 tablespoon should coat it pretty well. Place in the oven and bake for 10-12 minutes, depending on thickness, until opaque and flakes easily with a fork. Remove from oven and allow to cool for a few minutes. Use a spatula to separate from the skin and place in a bowl. Use a fork to break the salmon into chunks. While she salmon is baking, make your corn and bean salad. Place all of the ingredients in a medium saucepan, stir to combine, and heat over medium heat until everything is just warmed through. Remove from heat and set aside until ready to serve. This can be served warm or cold, so making ahead of time is also an option. 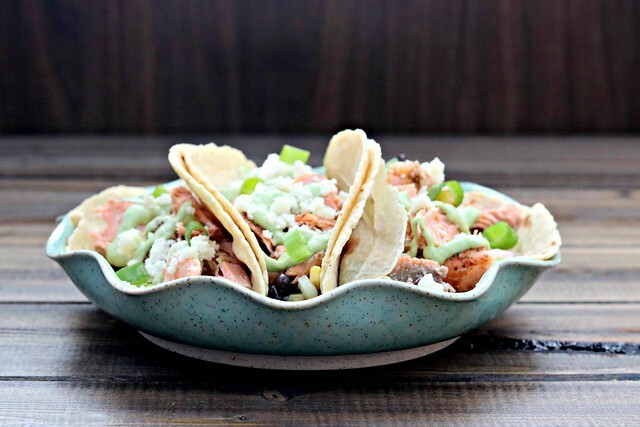 To assemble the tacos, warm your tortillas and top with a few spoonfuls of the corn and bean salad, a generous portion of the salmon, and then top with the avocado jalapeno lime sauce, some sliced green onions, and a sprinkle of crumbled queso fresco. Voila! Taco perfection!